So I've been writing these fairly frequently lately. I assure you that it's not because my roommate's out of town for the week and I never realized until now just how reliant I am on just wandering into his room and seeing what he's doing before I mock-kill him in a creative manner and wander out. Nor is it because I've been creatively frustrated lately, partly because I'm supposed to be writing academic things and I have this weird habit of desperately postponing required writing by writing something else, which seems vaguely crazy and probably is but I get by. Nor are these all here in an effort to get Charlie to write something too because he's so lazy and he won't even write for you, our beloved audience, so I'm left to fill the void because he's too good to write things for you. Well, it's not entirely for those reasons. Of course, now we run into a problem, which is that I've run out of ideas for things to write. Well, strictly speaking, that's not true, but I thought you might want something that wasn't another anecdote from my personal history. I know I do. But that leaves everything else, which as far as my brain is concerned now is nothing else. I mean, I could just keep insulting Charlie, but given that he's the one posting these on our webpage, I should probably ration the disdain. No, ok, here, I just found a great picture! Isn't that amazing? Let that sink in for a second, and then tell me you wouldn't watch that Yogi Bear movie. It sure looks a lot better than the one I saw a trailer for in front of "Harry Potter 7.1". Seriously, what the hell was that? First of all, why is there this need to put live action and clearly CGI animals in the same shot together, interacting as if it were all real and really weird looking bears talked to people all the time? Was "Garfield" such a runaway success? Did anyone even see "Marmaduke"? What the hell, movie studios? Either make it all CGI or make it all real. Go find a real bear, tranq it (how can that not be the right spelling, spellcheck included with Firefox? I notice you're not making any better suggestions), and then make Tom Cavanagh react to THAT. Sounds like gold to me. Also, why are they trying to make Yogi Bear hip? I mean, I guess I understand that they want to appeal to young kids, who will apparently only watch hip things (this is based on my exhaustive research flipping through channels on a Saturday morning for about five minutes). But how hip does a talking bear who steals pic-a-nic baskets have to be? They've got him windsurfing and weird stuff like that. 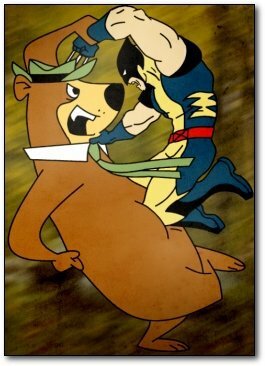 Is it possible that Yogi Bear was always like this, and I just don't remember it? Still, it might be better than those incomprehensible Kia Soul ads, with the hamster gangs driving either Kia Souls or cardboard boxes. I've been told I missed the commercial that would make these ads make sense. This to me does not seem like a good marketing campaign, to rely completely on the idea that your random car commercials have a dedicated following and that you can't just jump in - you have to have been watching from the beginning. What is this, "Kia presents Hamsterstar Galactica"? Actually, I might watch that too.